Facebook is clubbing two of their most successful features, Facebook Live and Facebook 360 degree, which the company will be unveiling in partnership with National Geographic. 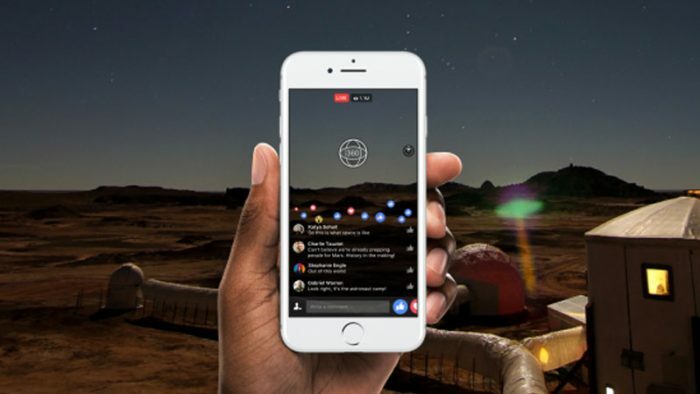 The first Live 360 Degree video to be broadcast by National Geographic on Facebook will be from the Mars Desert Research Station facility in Utah on December 13, 12PM Pacific Time which is 1:30AM in India tonight. The upgrade comes soon after YouTube, competitors in the video arena, announced their version of an upgrade for content creators on their platform, in 4K resolution with 360 Degree or standard formats. Twitter’s Live video challenger, Periscope is trailing behind the two bigwigs as it does not currently offer high definition or 360 Degree Live streaming options. As Facebook continues to further their platform’s reliance on video content that provides an engaging and immersive experience for their users. Facebook Live yielded rich dividends during the Rio Olympics as the company entered into an unprecedented agreement with the International Olympics Committee to grant a behind the scenes immediate sneak peek into the Olympic Games. For the social networking giant, Live video is the next big thing as the company rolls out Live video support for Instagram, the photo sharing platform it purchased in April 2012. Live video for Instagram is being rolled out in the United States, with a key factor that sets it apart from its parent company’s Live video functionality; the Live videos on Instagram disappear once a user concludes their Live broadcast. With YouTube focusing mainly on content creators on their platform to avail the 4K 360 Degree streaming features, Facebook takes a more friendlier approach bestowing the feature in the hands of all its users. Although it is possible for anyone to Live stream 4K 360 degree on videos, it is a platform that thrives on content consumers, whereas Facebook witnesses more proactive involvement from all its users. Additionally, any enthusiastic user wishing to give the YouTube feature a go will be hindered by the requirement for a special encoder software on their computer, which to a layperson could be strenuous to say the least. Facebook plans on releasing Live 360 to all Pages and users on their platform in a few months, as the company awaits user response and iron out the kinks if any. You can check out the inaugural Live 360 stream from National Geographic at 1:30AM tonight, which will allow users to experience the emergence of seven space scientists emerging from their pods, at the Mars Desert Research Station facility in Utah. The seven scientists simulated every aspect of living on Mars over the course of 80 days. Facebook Live 360 will lead users to the living quarters of the scientists, how they suit up in their space suits and take the rover for a spin on the Martian landscape along with a special Q&A session with science experts, writers and thinkers, who will take questions from the Facebook audience.